Gulp. It can only be That Video. The grainy screen. The sinister white noise and flickering, almost subliminal images. The creepy well in a secluded clearing. 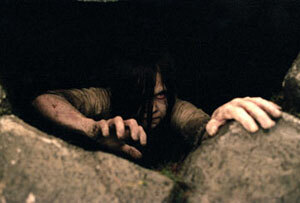 Only this isn't the cult classic Japanese Ringu, this is the Hollywood remake of the sequel. And whilst as remakes go, it isn't bad, it still falls far short by comparison (or by comparison to Ringu, anyway - I haven't actually seen the Japanese Ringu 2 yet). 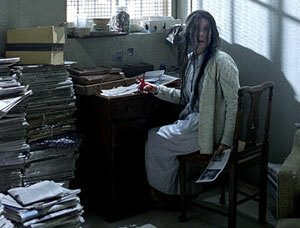 Anyway, barely have mother and son arrived when evil Samara raises her wiggy head once more. And this time it would appear that the video is fairly irrelevant. Killing off teenagers has become old hat: this time, she's after Aidan. And by God, if ever a child were born to be possessed it's him. With his scarily neat hair, weirdly over-large head and freakily polite diction, he's like a cross between Damian and that strange kid out of that spelling bee film. Spooky. As Samara takes control and Aidan's temperature plummets, he's taken to hospital by Rachel's concerned boss, Max (an obvious stooge whom Samara soon makes short work of). Allegations of child abuse begin to fly about - and not without reason, I might add. Time and again Rachel, the world's most rubbish mother since Mrs Bates, leaves poor wee Aidan on his own, only to fall prey to Samara's evil tricks. If you knew your son was being stalked by a psychotic ghost who lived in a well full of water, would you leave him alone in the bath? Well, duh! As any concerned mother would do, she leaves him alone in the hospital, wired up to a monitor, and goes off in search of the truth behind Samara's birth - which I won't give away, except to note that it involves a rather over the top confrontation with her lunatic mother (an unrecognisable Sissy Spacek), who looks like Michael Jackson in a bad wig. The final portion of the film is made up of a string of slightly disappointing climaxes, each designed to make you think that Samara has finally been destroyed, whilst all the time you know she can't possibly be because it was far too easy. Until the final climax, when she is destroyed (oops. SPOILER! ), and it is far too easy. Oh well. 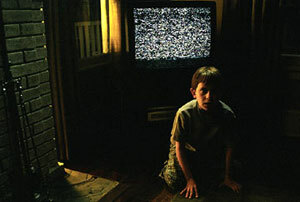 Still, it does have some fairly moving moments, in a Poltergeist stylee (devoted mother jumps into white noise on telly to save beloved son. oops. SPOILER. you get the picture.) and kind of makes sense, so I guess I shouldn't complain too much. The Ring 2 isn't exactly awful (although it's badly let down by an utterly ridiculous 'attack of the killer Bambis' scene, in which a herd of cute CGI deer charge Rachel and Aidan as they drive through the woods - there is a spurious explanation for this but. oh dear). However, it suffers in comparison to the Japanese Ringu. The killer video isn't nearly as weird and creepy, for starters, and Sadako pisses all over Samara, who looks more like Golum with hair extensions. All in all, this remake just isn't that scary. The plot is cleverly constructed and there are a couple of 'new pants please' moments when you'll jump out of your seat, but, even with the same director at the helm, the sinister sense of menace and hidden, unstoppable evil that haunts the Japanese version is pretty much missing from this slightly sentimental sequel. From the ghastly dead teenagers to the glazed blank eyes of the possessed child to the bath tub full of black goo to the creepy child ghost. we've seen it all before. Probably when we were teenagers, round at a friend's house. Have you ever seen something so scary, you had to show it someone else? Yes, but it wasn't The Ring 2.